I’m unashamed of my relationship with sugar. I just love it. You’re not going to get me giving it up, not for a detox, not for Lent, no way. I have fond memories of finding my Nanna’s many stashes of Pascal’s Columbines behind lounge cushions and inside dressing gown pockets, so it’s one of those hereditary things you just can’t argue with. I’ve handed it on to my youngest, the Horror From Outer Space as he’s formally known, who is forever discovering where I’ve hidden the the cooking chocolate and leaving sweet wrappers in his pockets. Don’t get me wrong, I don’t eat a lot of it. As you may have gathered from this blog, I don’t use much processed food, and despite the enormous amount of baked goods I turn out I rarely eat any of it. For breakfast I have a bowl of chaff with plain yoghurt, lunch and dinner are also fairly simple and I bow to the combined wisdom of the health pundits in my snacks. Because I like my sugar fairly concentrated, I don’t go diluting jam with bread, I eat it from the spoon. I like to buy the pure icing sugar rather than the smooth pour mix ostensibly because I don’t want additives, but actually because the pure stuff forms lumps that are easy to consume standing in the pantry. So it is with my preferred sweets. I don’t want to go mucking around with bits of wafer or nuts or any such fillers. I like them as close to pure sugar as possible. 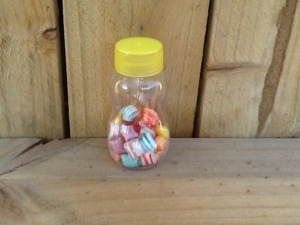 So I’m very wistfully consuming my last bottle of Bo Peep sweets bought from a Darrell Lea shop. We used to get them in our Christmas stockings, back when they came in glass bottles. You can’t really hoard them for very long after you’ve opened the bottle, they get stuck together after a few days and you have to get in there with the end of a spoon, which smashes up their inviting pillow shapes. On the rare occasions I buy them for myself I look for a bottle in which the reds and purples dominate, rather than the less desirable orange and the completely give them to the husband black. There’s not a great deal else I’m that fond of at Darrell Lea. I’ve never understood the appeal of soft centred chocolate, the toasted marshmallows aren’t as nice as they used to be, and liquorice is anathema. I’m not sure what we’ll do without the Bulgarian Rock as the ideal gift for my father in law, though. Perhaps I’d better get up there one last time and lay in ten year’s supply.